Financial Empowerment Spring 2018 Classes are here! 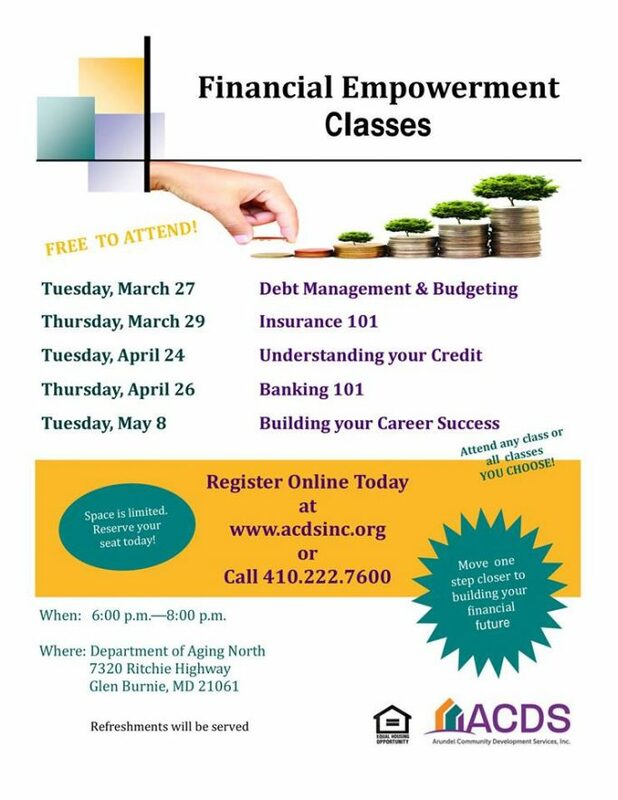 - Arundel Community Development Services, Inc.
You are here: Home / Home Featured / Financial Empowerment Spring 2018 Classes are here! ACDS is pleased to announce that we will be offering a second series of FREE workshops to help residents move toward financial stability and success in Spring 2018! The series, which will be taught by experts in the field, will include five evening workshops on a variety of important financial topics. You can attend just one workshop, a few, or all five workshops. Click on the links below to learn more about the workshops and to register. Anne Arundel County residents attending will be eligible for free, one-on-one follow up financial counseling. The Financial Empowerment Program is made possible by Anne Arundel County, private donors, and the State of Maryland CITC Program.